MICHAEL Anthony Doherty has a busy couple of weeks ahead of him. Following his appearance on Winning Streak, Michael will attend the wedding of his daughter Helena next Saturday. 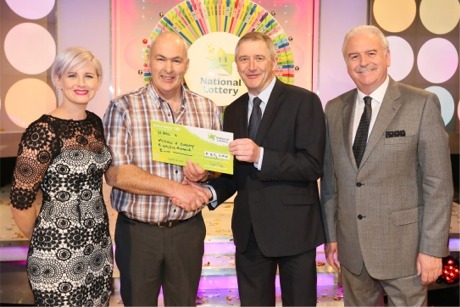 The 54 year old from Desertegney outside Buncrana was the biggest winner on Saturday night with prizes to the value of €85,000. He and four other players from Longford, Mayo, Dublin and Clare shared a total prize pot of €203,000. Civil engineer Michael Anthony is married to Suzanna from the neighbouring village of Clonmany. The couple met at a dance when they were teenagers and have three sons and a daughter. Michael Anthony Doherty receives his winning cheque following his appearance on Winning Streak. The eldest in a family of eight, the local man is now looking forward to a good celebration at his daughter’s wedding with his winnings. He would also like to go on a holiday to the US with Suzanna. The Desertegney man was supported in the audience at the weekend by his wife and children, siblings and family friends.